After you have chosen the outdoor patio bench, Outdoor Patio Bench Cushions will be next on your list. You will have to decide a style and shape that will fit your bench. Most cushions will come in many patterns and colors to match your outdoor decor. Look at the following examples and find the one that most fits your outdoor space. 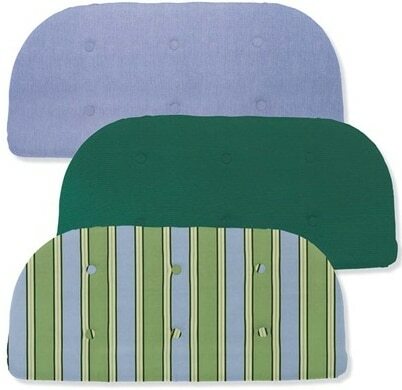 This classic knife edge (has a single seam on the front edge) cushion is available in 22 different color patterns. See the link below for color combinations. The rounded design will fit most benches. 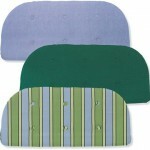 The polyester material is weather resistant and UV protected to reduce fading. Will have strings to tie to bench. This cushion is 41¾ inches wide, 18¾ inches deep and 3 inches thick. The Tufted bench cushion will have a knife edge front with six buttons arranged to give a more formal look. This cushion will be available in 22 color combinations. See the link below for color combinations.The rounded design will fit most benches. The weather resistant and UV protected material will help reduce fading in the sun. Will have strings to attach to bench. Polyester material easy to clean. 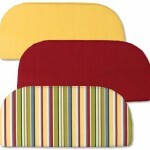 This cushion is made with a knife front edge with 17 different color patterns to choose from. You can mix and match each color for your exact combination that will fit your decor. See the link below for color combinations. The rounded design will fit most benches. The material is made to be fade, stain and UV resistant. Will have strings to attach to bench. This classic cushion will have six buttons to give it a tufted look. A knife edge on the front and a rounded back with strings to attach to the bench. The 17 color combinations can be mixed and matched for your decor. See the link below for color combinations. The material is made to be fade, stain and UV resistant. 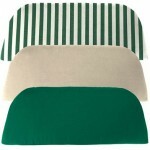 These knife front edge cushions are available in nine different sizes and up to 22 different colors. See the link below for color and size combinations. Made of a polyester material that will resist all weather conditions and UV-protected for fade resistance. This cushion will be available in sizes ranging from 36 inches wide, 16 inches deep and 2½ inches thick to a large 60 inches wide,16½ inches deep and 2½inches thick. 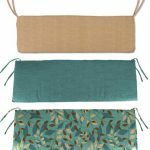 If you would like more information on the Outdoor Bench Cushions in this article follow the link below. When looking for your outdoor bench cushions several thing will need to be considered, size of bench, style of cushion, color or pattern and material. When you are measuring your bench use the following video as a guideline for the correct sizing of your cushion. If you are concerned with your cushion being out in the weather, get a storage container for your patio area. See this link for some examples. This video will show you how easy it is to clean your cushions even it you spill something that you would think would be permanent. How can you may these durable enough to the weather? It seems some outdoor cushions and fabrics just simply wear out over one season and need replacing. What would you suggest? Look at some of the storage cabinets for your patio and deck areas. if your outdoor weather kills your cushions that fast, they should be stored when not in use. Fantastic list of options here – I’m spoiled for choice. I like the way you have included video reference to products as well. I am glad i had the information that you were looking for. Nice stuff John. Just in time for the spring/summer season. Love the videos. Those are colorful Bench Cushions. I personally prefer the one that is weather-resistant. This way, the bench cushions can endure longer from different temperature. Which one you like the most John? I like the one that you can select different sizes. The fabric will only last a short time in the outdoor weather. Storage should be arranged for extreme weather conditions. Since I live in the tropics, water-resistant and UV-protected cushion is very important for my outdoor bench. I have had a bad experience where my cushions fade within a month. Obviously, those are of very poor quality and I actually got them from a clearance sales. Lesson learned! One of the items that you will need to add to your outdoor space is some kind of storage for your cushions. Waterproof storage will be what you want to look for, some of these items will be more than just a plastic box.